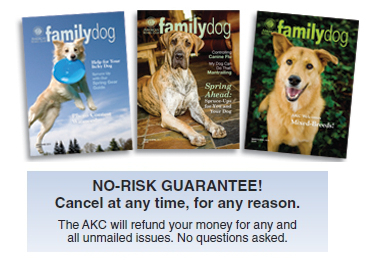 One Year (6 bi-monthly issues) of AKC Family Dog for just $12.95 Best Value! Two Years (12 bi-monthly issues) of AKC Family Dog for just $18.95 Best Value! Note: Available to USA addresses only. Subscriptions begin with the next available issue. If you chose the Gold Package dog registration or enrolled in the Canine Partners Program, you are already on the subscription list for AKC Family Dog.